A huge thanks to our friends at Fun & Function for sponsoring today’s post. 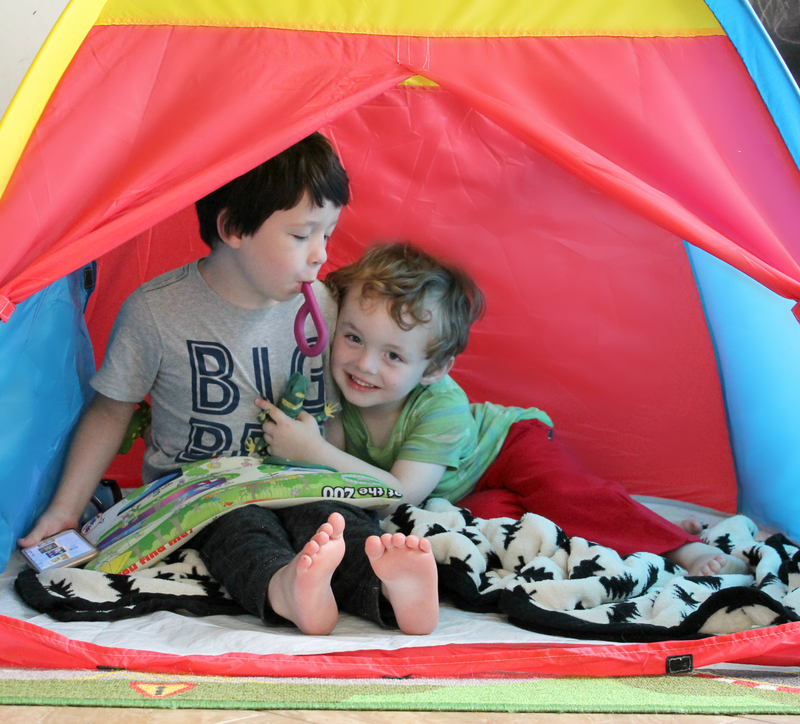 Keep scrolling to see how you can go about Creating a Self Calming Tent for your home! 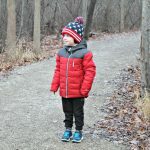 I am so excited about todays post, because I’m sharing our Self Calming spot for Wyatt with you! 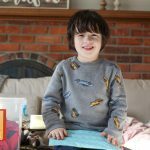 As you probably already know, my sweet little Wyatt has Autism. 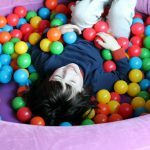 And on my blog I love working with companies that help to make our lives easier by developing products that help Autism families. 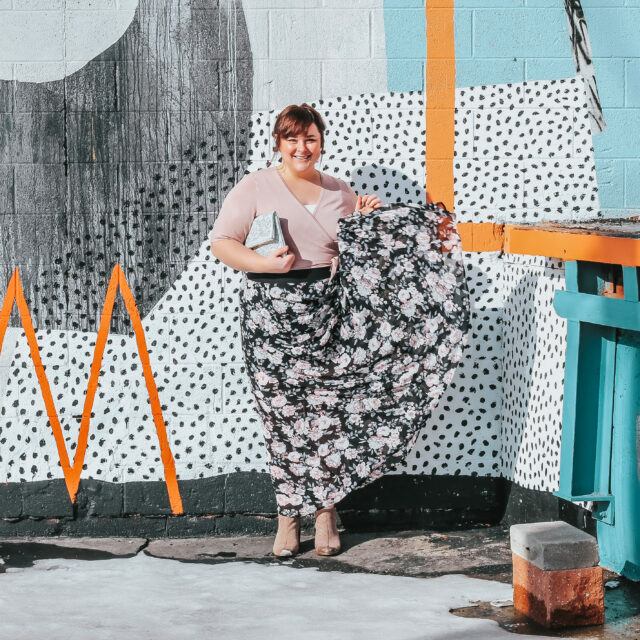 Fun and Function is one of those companies (we love them!). If you haven’t read our Summer Boredom Busters post, we shared some of our favorite products! 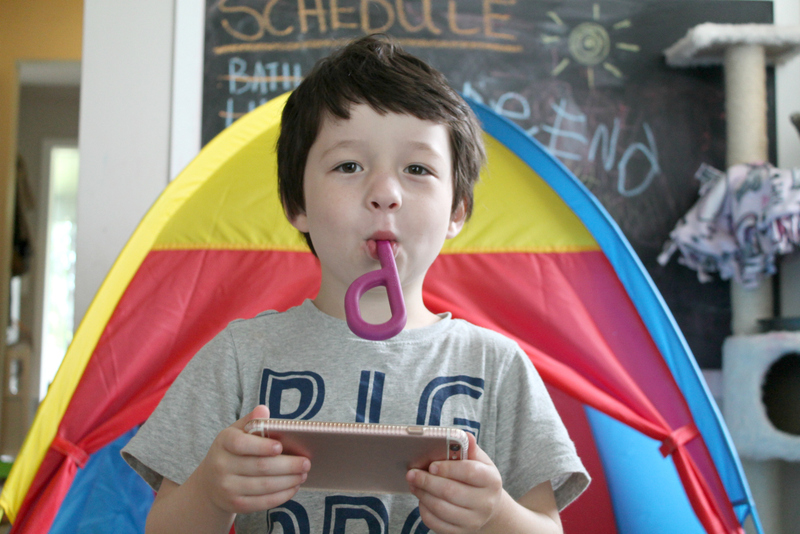 Today we’re talking all about Wyatt’s self calming spot. We have a few of these spots in our home for Wyatt to go when he’s feeling overwhelmed. This spot helps him to calm himself and take a break for a few minutes until he’s ready to come back and join us. 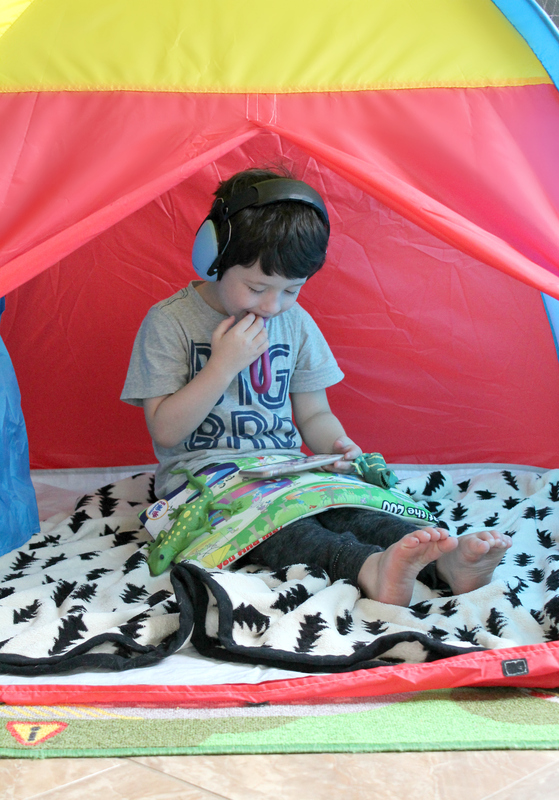 These breaks are necessary for Wyatt, and I am so excited to share what’s in Wyatt’s calming tent, so you can make one for your home, too! Wyatt is really into taking photos and videos of himself, so when I upgraded my phone, I kept the old one for him to play on. It’s one of his favorite things, he sits and looks through all of the photos and videos he’s taken and is able to take new ones, too. Whenever he is getting overwhelmed or upset, looking back on his memories really helps him. So his phone is always charged and waiting just in case. Everything from Wyatt’s tent can be found in this Self Calming Tool Kit. It’s under $200 and has everything you need. 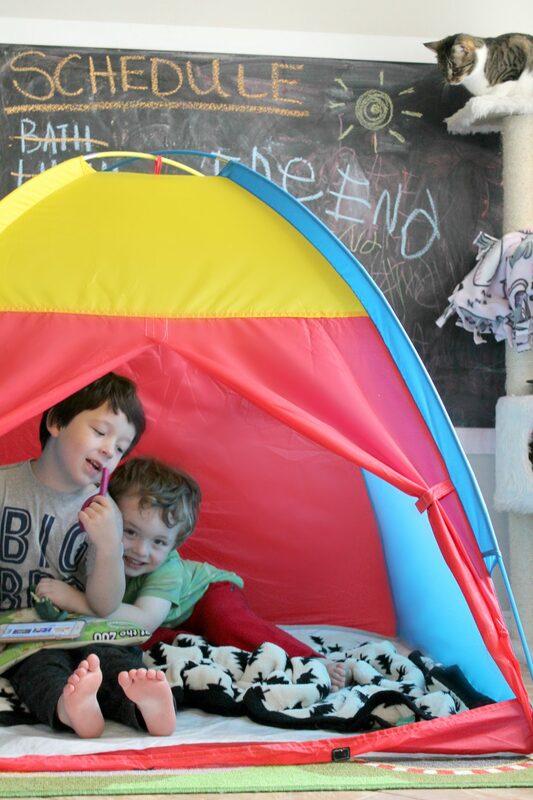 Homework Tent – This tent is so affordable (under $50) and perfect for the base of your calming area. I added a soft blanket to the bottom of the tent to make it extra cozy. Wyatt loves soft textures, so having a soft blanket in his tent is a must. The blanket pictured is the Forest Plush Blanket and it’s under $20 and washes up great. Noise Reduction Headphones – These headphones are amazing! Wyatt had been using a pair of my headphones, but these are great when he wants to block out the noise. He’ll sit in his tent, put on his headphones, and quietly look at a book or his photos. Find Me Lap Pad – We love, love, love this lap pad! It’s great for long trips in the car, too! It has an adorable ZOO scene on it where kiddos can find different animals, etc. Kind of like an eye spy game. The weight helps keep Wyatt still and calm while he takes his break. Sometimes he doesn’t need it, but other times it’s the first thing that he grabs. 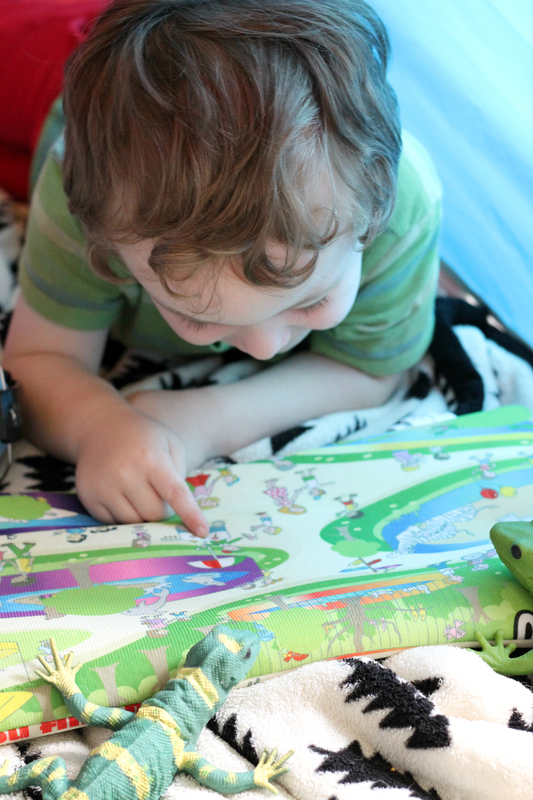 I love that this tent allows him to customize his needs on his own. Sit-A-Round cushion – On extra wiggly days, this cushion is a go-to. You can inflate it for a firmer feel, or let some air out for extra wiggle room. One side is completely smooth, and the other has a raised pattern for tactile stimulation. This cushion is also great at the dining table or desk if you’re kiddo is extra wiggly. Spaghetti Fidget – This spaghetti fidget is multi-purpose. It’s great to play with between your fingers, and it’s also a durable chewy. 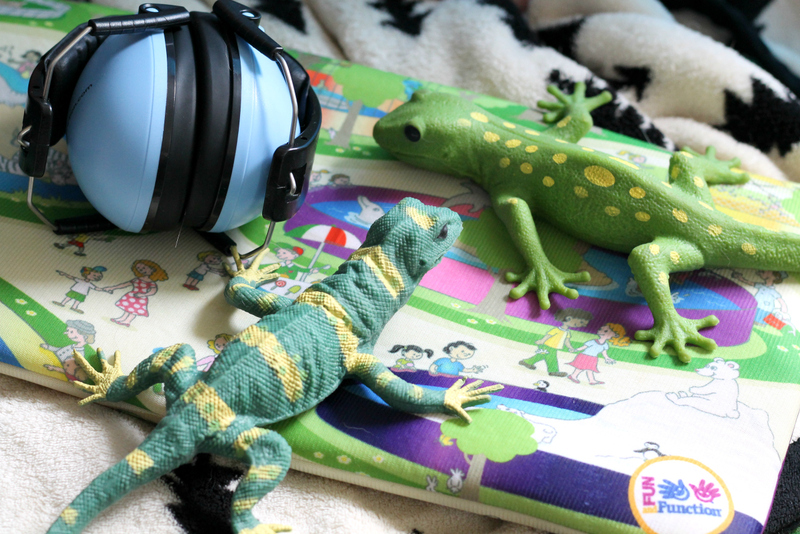 2 Squeeze Lizards – I’m sure it comes as no surprise that these adorable squishy lizards are a huge hit in our house. 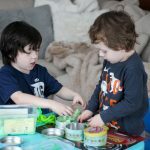 If you’re looking for a great fidget toy for your child, this is it! These can be stretched, smushed, and pulled. When released they snap right back into shape. 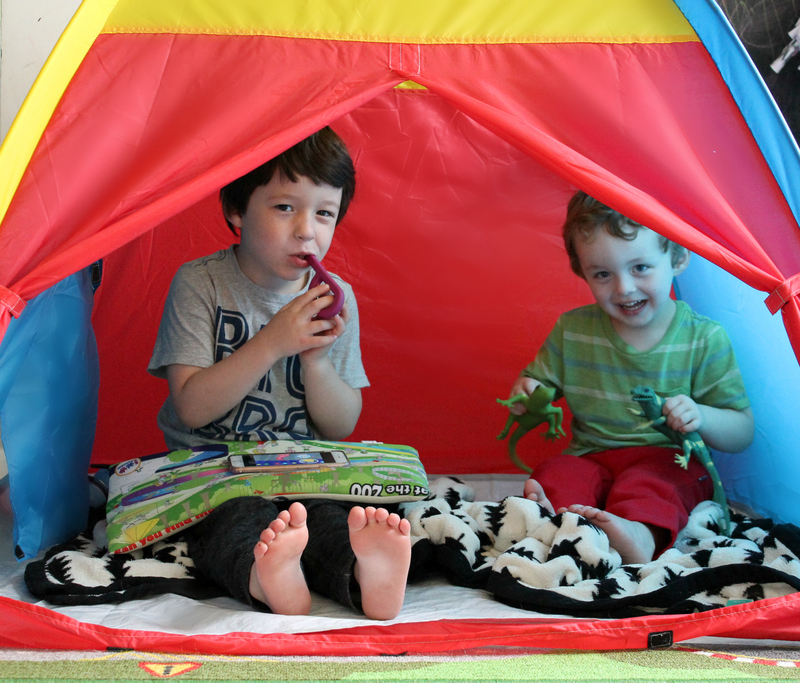 We’ve got two lizards in our calming tent, and we take them when we go on the road, too! 3 Grabbers – We love these chewies! They contain no pthalates, latex, PVC, BPA or lead – so they’re safe for your kiddo to chew on. They’ve got a built in handle for easy use, and they’re super easy to clean. These are one of Wyatt’s favorites, and we take them everywhere we go! I know there are other Autism mommas with chewies in their purse, right? If you’re looking to add one to your home, be sure to check out the Self Calming Tool Kit from Fun & Function! Do you have a calming space in your home for your child?